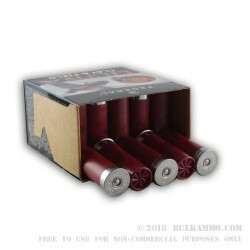 If you can get past the low brass (in this case galvanized steel) base of this shell, you will be able to tap into some of the best all-around ammunition that you can put in your 12 gauge shotgun at an astoundingly low price point. The versatility of this shell is seriously amazing. The #8 shot is a perfect choice for small game and for range use on clays and for dialing in patterns. But the fact that this is lead based, with a #8 shot size in a 1 1/8 ounce payload means you can make a significant argument that this will be the only field load you need to carry for anything up to about coyote in size. That, paired with the excellent pricing scheme, makes this a very desirable and versatile standard sized round. 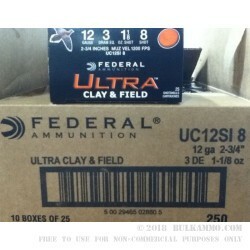 If the range use cases aren’t obvious to any shotgunner, these loads are super effective for most clay or competition shooting needs considering the moderate recoil and power (able to function most mainstream firearms as well as impact properly, any target you can throw at it. 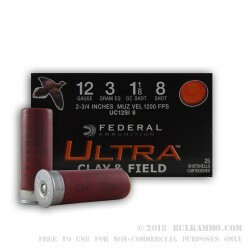 For the money, you won’t find too many other mainstream shell offerings that can keep up with the capability or versatility of the Federal Ultra Clay & Field. No problems with the ammo, it ripped the target as it should. Ammo is fine, service is excellent, product arrived as promised, follow up was impressive, a fine bunch to work with and I will be using them again.